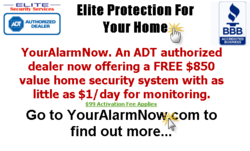 Nation's favorite home protection company Elite Security Services is now offering their efficient service to improve the overall condition of Phoenix home security. The comprehensive protection packages from the company have made life difficult for the miscreants throughout the United States and Canada since they started their journey about a year ago. It may be recalled that the company was founded by well known security consultant Mr. Paul Shakuri. The affordable price of their security plans has been the prime reason behind their success in the industry so far. All three protection plans from them have excellent functional features in spite of their competitive price range. Phoenix home security has been a cause of concern in the recent years because of the steady increase in the rate of organized crime. Many companies have been offering security service in this part of the country for years. However, unlike these companies, Elite Security Services has been extremely proactive towards developing cost efficient security plans. The Basic Package from the company is available for a monthly rental equivalent to $1/day. The other two packages offer a plethora of advanced features for slightly higher rentals. They are also offering next day installation service without any additional expense for their customers in Phoenix. Elite Security Services has specially designed security packages for households without a landline telephone connection. This enables the homeowners to avail undisturbed domestic security making use of advanced cellular backup technology. Talking about the service offered by the company, the owner Mr. Shakuri recently said, "We created this organization with a much greater vision of playing our part in creating a crime free society. We would remain committed to offering low priced security plans so that even the common homeowners can afford them". Looking at the progress of the company, it can certainly be said that Phoenix home security is in safe hands.